The party still starts at 9pm and we'll be starting the night off right with freshmen Twin Dragonz (Chris Martel and Bruce Wong). The duo tore it up at VT's Afterglow party last semester and are making their Shiva Rave debut on Friday. At 10pm, Respire (Paul Noonan) and Fenris (Sam Finer) take over the floor. Respire made the campus party sounds last semester, most notably at the Shiva Rave and DayGloToga alongside DJ Olmec. Fenris returns to Vassar this semester after working (and DJing!) for the Obama campaign. The two are tag-teaming a powerful electro hour. DJ Paradigm (Felicia Minchin, '09) arrives to the scene at 11pm. She played last semester's Shiva Rave to great acclaim. Her carefree, fun, and happy mix stylings will have you singing along to your favorite classics while dancing to the unknown. To close out the night from midnight to our new 2am time, Yoshitoshi, Man Your Battlestation! brings you two hours of madness from the combined forces of DJs Vainglory (Christopher Mykles) and Morton Sutton (Conner Marx). With their powers combined it will be the most random assortment of music humanly possible." 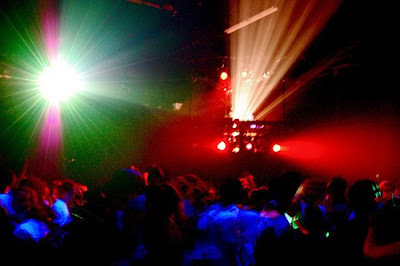 Check out the rave tonight (Friday) from 9-2am in the Shiva.